Although the main purpose of glasses is to correct your vision so the world around you isn’t a blurry mess, it’s also important to choose a frame for your lenses that will help to compliment your face, jawline, and everything else about the way that you look. Finding the right frame for your face is a very important factor to consider during the glasses-buying process, and today we’ll be focusing on how to get the best glasses for bald guys. When it comes to glasses, the type of hair (or quantity of it) will make a big difference in regards to how your new frame looks on your face. A pair of glasses that look good on your buddy Tom with a full set of hair may not look all that great on you if your head is on the shiner side of things, and because of this, it’s important to take some extra time when out buying your next frame. So, exactly what kind of eyeglasses frame works well for bald men? There are many different types and styles that do, and the 5 we’ve picked out below are some of our favorites. The first pair of glasses on this list are technically sunglasses, and whether or not you want to pop out the lenses for prescription ones or just use the non corrective ones that come with this pair, this is an awesome look that doesn’t come anywhere close to breaking the bank. One of the biggest reasons we love these glasses is the fact that they come in a really wide variety of colors. Whether you want a more subdued black option or want to make a statement with a blue or red color, Retro Rewind has you covered in these regards. Plastic is the material of choice for the frame, and although it isn’t the most premium thing in the world, it still feels rather sturdy and like it could take a beating if necessary. Polarized lenses do a fantastic job at making it easier to see when out and about during the summer, and the free microfiber pouch gives you an easy and stylish way to store the glasses when you aren’t wearing them. Click here to view Retro Rewind Classic Polarized Sunglasses on Amazon. Moving to clear glasses, we really, really love the style that Outray Vintage crafted with its Retro Classic Half Frame Horn Rimmed Clear Lens Glasses. This is another product with a plastic frame, but Outray Vintage has done a great job at making the plastic used here look and feel absolutely fantastic when you consider how little these things cost. The option that we tried out was not polarized, but Outray Vintage does make a version of these glasses that features polarized lenses so you can block out big rays from the sun when out with friends or family. The only real complaint we have about the glasses is the fact that the plastic lenses can be difficult to clean at times. Then again, if you’re going to be swapping these out for your prescription setup, this won’t be something you’ll have to deal with at all. Sticking with Outray, another product from the company that we really fell in love with is the Outray Classic Men’s Or Women’s Metal Frame Aviator Sunglasses. These glasses cost about the same as what you’ll pay for the other Outray ones mentioned above, but these come with a more durable metal frame. The frame is quite a bit thinner than the horn rimmed ones above, but the look here is still one that we cannot get enough of. The appearance of these glasses is very simple and clean, and while some guys might think it goes a bit too far towards that simple spectrum, we really did like the direction that Outray took with this pair. Whether you need to pop the lenses out to correct your sight or simply want something to compliment the rest of your outfit, this is an excellent purchase that does a great job at looking awesome without costing an arm and a leg. Click here to see the pricing for the Outray Classic Aviator Sunglasses on Amazon. If you’re losing your hair and want to try and breath some new life and energy into your appearance, few glasses will help you out as much with this as the AEVOGUE Aviator Sunglasses For Men. Although still technically aviators, the look of these is quite a bit different than the aviator glasses from Outray the we just talked about. The frame of these glasses is a tad bit thicker, and the shape of the lenses are a little wider and squared off as well. It’s certainly one of the most fashion-forward looks we’ve come across, and while it’s a bit odd at first, it’s a look that quickly grows on you in no time at all. A metal frame helps to keep these glasses looking and feeling as premium as they can be, and the variety of colors to choose from is great for finding a look that matches you and your personal style as closely as possible. Click here to see the Amazon's current pricing on AEVOGUE Aviator Sunglasses. The final pair of glasses we’re talking about comes from Newbee ﻿Fashion Clear Lens, and while this design is certainly a bit more subdued than what you’ll get with the AEVOGUE glasses above, it’s a style that still looks great and is sometimes a better choice depending on what you’re wearing or what situation you find yourself in. As a whole, this is a very simple and clean look that will compliment any man — bald or hairy. A plastic frame and polycarbonate lens offers a nice blend of durability and affordability, and the numerous colors are something that we’re also big fans of seeing. Some customers have noted that the glasses are a tad thicker in person than they appear online, but this one tiny gripe aside, it’s hard to do much better for a simple, clean pair of glasses than what Newbee Fashion is offering here. With the said, those are the 5 best glasses for bald guys that we were able to find. 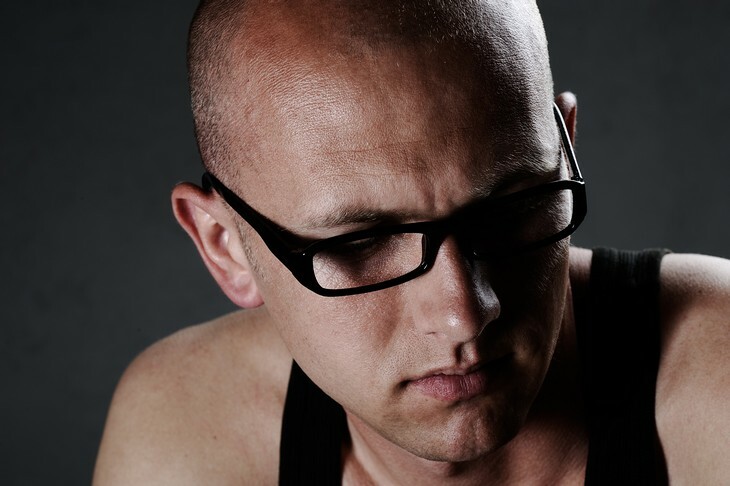 We’re sure there are a lot of other glasses that will compliment you and your bald look just fine, but if you don’t want to go through any guessing and testing and just play it safe, stick with our list and rest easy knowing that all 5 of these glasses will do your bald head plenty of justice.